Growing up on the beautiful Brahan Estate in Ross-Shire, Aileen Campbell was surrounded by the history, mystique, and folklore of her native Scotland. With her father being the manager of the castle's gardens, she roamed free among the vast acres of the manor. These memories of growing up in such a romantic setting have remained with her and inspired her to write and illustrate The Wee Scot Book and produce its accompanying audiocassette. Her childhood provided the source of her stories, but it was her friendship with Dr. James Pittenberg Macgillivray that helped her capture the artistic countryside and lively characters in her illustrations. As a teenager she was introduced to "the Sculptor Royal to the King," who in turn took a liking to the Scottish Highland lass and became her mentor in writing and art. Her study of the arts was also matched with her study of medicine and training as a nurse. As World War II ravaged the country, she served as a nurse in Edinburgh at the the Royal Hospital for Sick Children. Her husband's service in the Royal Air Force required several moves throughout the United Kingdom with the family relocating to the United States in 1947. In the U.S., she continued her work as an registered nurse at private hospitals and before her retirement in 1985, had served with the Howard County Health Department. Prior to this, she became a certified nurse-midwife at the Johns Hopkins School for Hygiene. She has since left Maryland and relocated in the Shenandoah Valley of Virginia. There she has returned to her artistic pursuits with writing, painting, and storytelling, reflecting back on the Scottish homeland she left long ago. With an interest in preserving the stories of her childhood, she wrote The Wee Scot Book for her grandson. Gather around, children, for stories of the Scottish Highlands and stone castles. Here, the blow of the bagpipes ushers in the sheep from the hills and sailors on the coast, and in the dreamy night, fairies scurry about. On this lively compact disk, author and narrator Aileen Campbell compiles authentic songs and tales from her Scottish childhood. Gather around children, for there are stories told of a world of Highlands and stone castles. Here the blow of the bagpipes ushers in the sheep from the hills and sailors on the coast. And in the dreamy night, fairies scurry about and the sandman Angus sells dreams to the little ones. 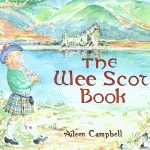 This is a real place called Scotland and here in this book are the poems and stories of its children.